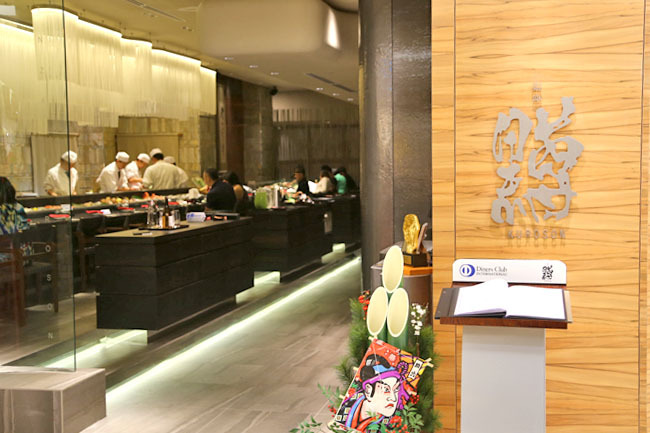 Come to think of it, Ngee Ann City with flagship stores of Takashimaya and Kinokuniya and huge Japanese community support, didn’t have too many Japanese restaurants previously – Tampopo, Tonkichi, Sushi Tei, Ajisen, to the more recent The Sushi Bar. Those who have not been to Ngee Ann City in a while would find its part of the mall completely revamped. 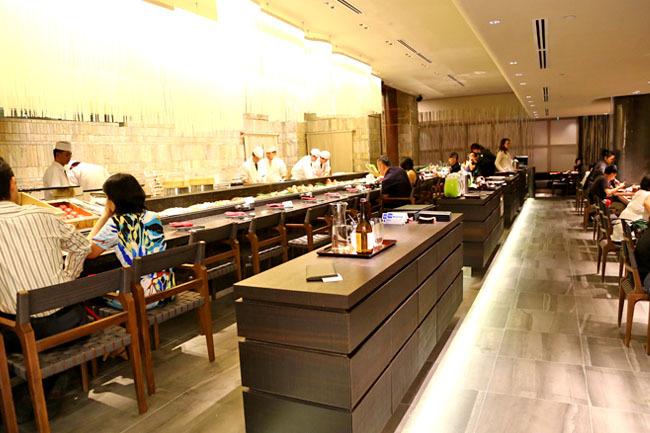 The space previously occupied by Kinokuniya is now home to boutiques, ABC Cooking Studio (apparently very popular among Japanese expats), café Patties and Wiches and Japanese restaurant Ginza Kuroson. Some background of the company Henry Bros who is behind Ginza Kuroson. 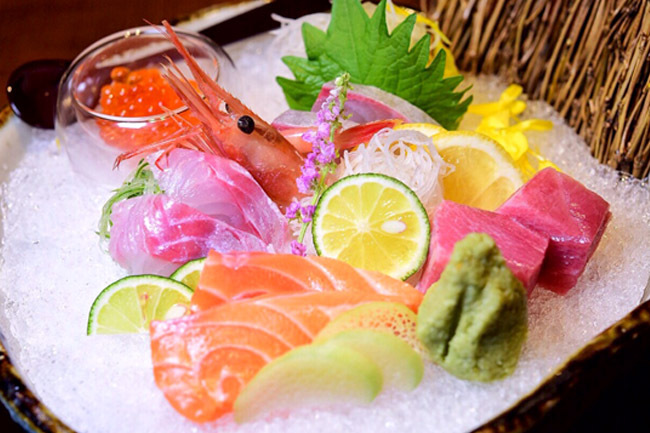 With a motto of “Deliver fresh Japanese local fish to the world”, they are in the fish exporting business, and have started restaurants such as Ginza Kuroson at Roberson Quay, Sushi Kaishin, and Ryoshi Sushi Ikeikemaru. 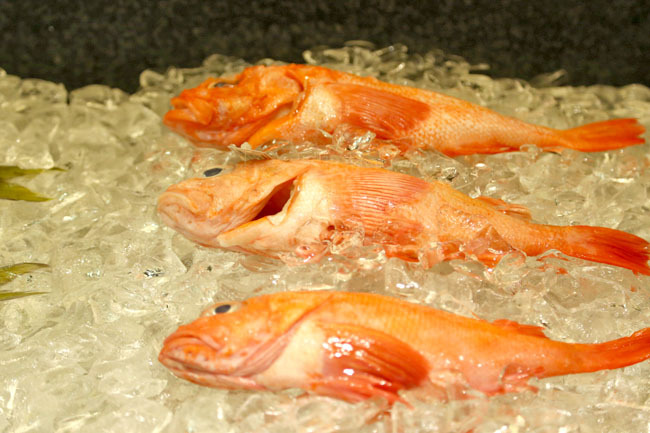 Ryoshi Sushi Ikeikemaru has been known for pricing sushi very affordably. 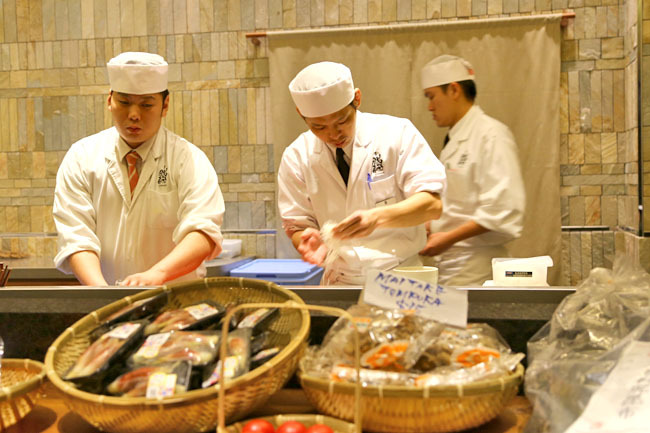 There was an immediate liking the moment we walked in Ginza Kuroson at Ngee Ann City, boosting a long sushi bar and robatayaki counter, display of fresh fish and seafood, an element black and red themed décor, with Japanese chefs skilling working their crafts behind the counter. Even the napkin was in a shape of a kimono. Ah, the attention to details. 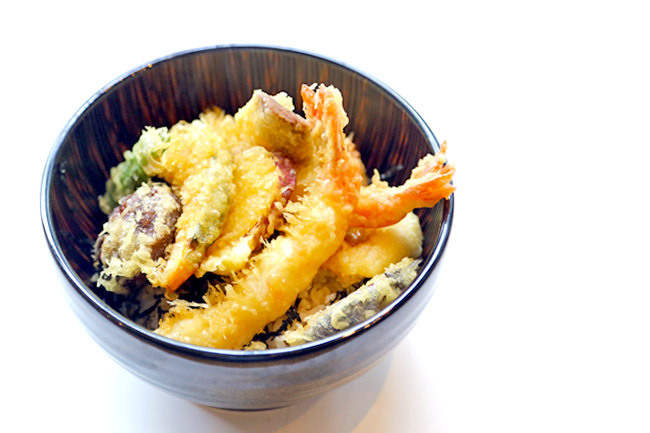 For lunch, Donburi sets are available, at a more affordable pricing than dinner. ( I knew because I went back again after two days! 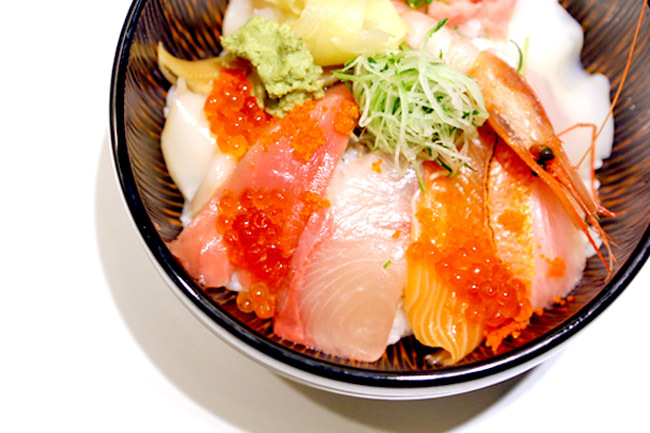 The signature Ryoshi Gokai Nagekomi Don – a bowl of sushi rice topped with assorted sashimi (better known locally as the Chirashi Don) cost $22 with a set of appetizer, salad, miso soup and dessert for lunch, and $28 ala carte for dinner. The sashimi also somehow tasted fresher on the Sunday than on a Friday when I initially visited. (Seafood shipment supposed to arrive on Tuesdays and Thursdays). The sushi rice could also be less dry. Otherwise, it was a bowl of quality fresh sashimi. Not my absolute favourite, but good enough for its price. 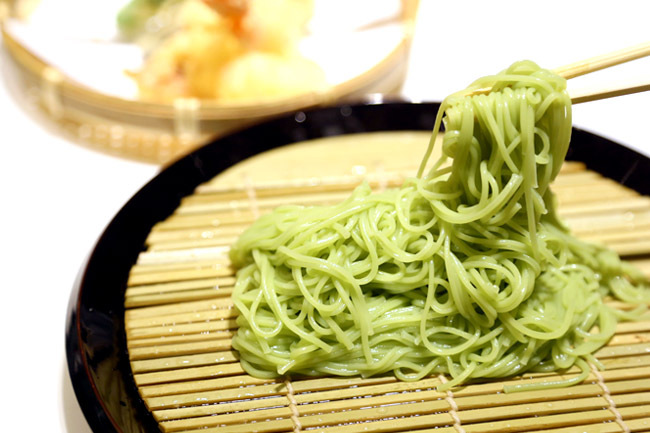 Do not miss the delicious cold Seaweed Somen ($12, $18 with assorted tempura) which is made with the waters of Shimanto River, known to be the ‘last crystal river in Japan’. It was thin and delicate, matched with refreshing dipping sauce. 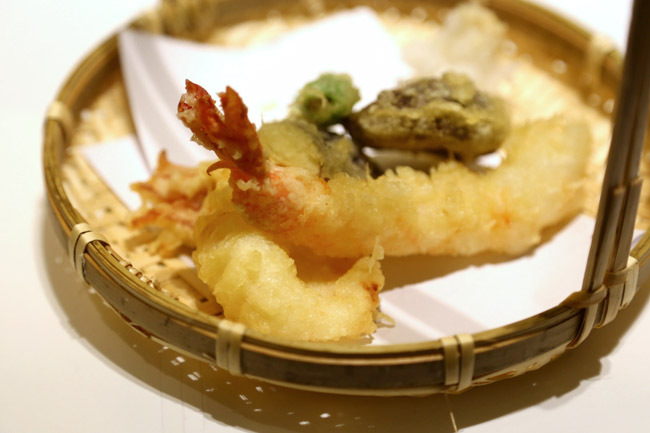 With a combination of fresh seafood, classy ambience, personable professional service and a comfortable price point, Ginza Kuroson is one of my favourite Japanese restaurant openings this year. I hope it stays this way. ← 10 Singapore Food Bloggers and Their Favourite Local Hawker Food!